Wilson Daily Times, 16 February 1940. On 23 September 1886, Willie Winn, 27, and Jennie Hussey, 19, were married in Wayne County, North Carolina. In the 1910 census of Toisnot township, Wilson County: farmer Willie Winn, 50; wife Jennie, 23; and children Bessie, 18, Cora, 14, Charlie, 11, Annie, 10, John, 9, Ray, 7, Dortch, 4, Pinkie, 1, and Jessie, 17. In the 1920 census of Toisnot township, Wilson County: farmer William Winn, 59; wife Jennie, 48; and children Charley, 21, John, 19, Dorch, 13, Pink, 10, and Jeneva, 8. In the 1930 census of Toisnot township, Wilson County: odd jobs laborer Willie Winn, 62; wife Jennie, 60; and children Roy, 23, and Pink, 20; and lodger Lula Ward, 45. 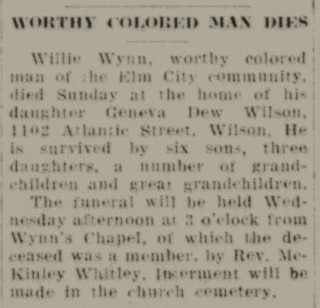 Willie Wynn Jr. died 11 February 1940. Per his death certificate, he died 11 February 1940 in Wilson; had been married to Jennie Wynn, but was a widower; resided at 1102 Atlantic Street, Wilson; worked as a laborer; was the son of Willie Wynn and Annie Williams. Geneva Dew, 1102 East Atlantic Street, was informant, and he was buried in Elm City. McKinley Whitley — in the 1930 census of Toisnot township, Wilson County: church minister McKinley Whitley, 28, and wife Ruth, 28. ← Emiline Woodard and children.